Kim understandably believed that the most valuable work she could do for her business was to churn out more billable hours–to turn some of her activities that don’t earn revenue into those that do. But that’s flawed thinking. Of course billable hours create value, in a sense that couldn’t be easier to quantify; Kim bills at $325 an hour. Yet if all she does is focus on converting non-revenue work into more billable hours, she’ll soon be in for a rude awakening. 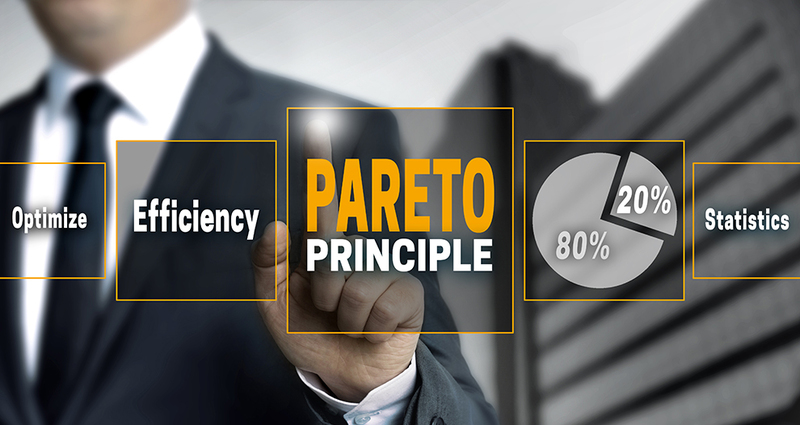 The reason why has to do with the all-too-familiar “80/20 rule,” otherwise known as the “Pareto principle,” which states that 80% of your efforts produce only 20% of your results, while the remaining 20% of your efforts drive 80% of your results. It’s not that this isn’t true–in my experience, and in loads of other professionals’ experience, it is–it’s just that it’s too often mistaken for a time management strategy: Find that 20% sweet spot, and just do more of whatever it consists of. Wrong. In order to nail down a more rigorous and effective approach, you need to apply the 80/20 rule to, well, the 80/20 rule itself. And that takes a little back-of-the-envelope math. Here’s how it works. Think of it this way: That high-value 20% is still a pretty considerable chunk of time. If you work five days a week, that’s one full day. So even if you could marshal all of your most valuable activities into a single workday, you’d have no real idea how to structure it. To help, consider that (in theory, anyway) if 20% of your actions generate 80% of your results, then 20% of that 20% produces 80% of 80% of your results. Now, you could of course apply this logic ad infinitum, and slice your days and hours and minutes and seconds into supposedly ever-higher-value slivers–but that would be preposterous, so don’t. But what just this additional round of multiplication means is that 4% of your effort (the 20% of your 20%) generates 64% of your results. In a 40-hour workweek, that’s a period of a little over an hour and a half. And if you can bear with me for one more math moment, you can apply this distinction once again: This means that 1% (20% of 20% of 20%) generates 50% of your results. Think about it—that’s around 25 minutes that can generate half of your output! To be sure, this is purely theoretical, but the theory is useful because it helps you parcel out your workweek into much more focused intervals. D-time is the 80% of unleveraged, wasteful time that only produces 20% of your total returns. Let’s call it the “80% mass” and give it a relative value of one. This is likely the chunk Kim wanted to shrink by upgrading 12 hours a month of her time. She intended to stop doing low-value tasks like responding to vendor questions that her staff could tackle or handling low-level administrative tasks. C-time is the 20% that produces 80% of your results. It has a relative value of 16–a quarter less input generating four times more output. That means every hour of C activities creates 16 times the economic value of one hour of D-time. For lots of people, this includes billable work, the time you spend directly generating a product or service. But it’s also where most people who take the 80/20 rule to heart tend to stop. B-time is the highly focused 4% that generates 64% of your results. I call this time the “4% sweet spot,” and it has a relative value of 64: One hour of B-time produces 64 times the value of the same time spent on D-activities. 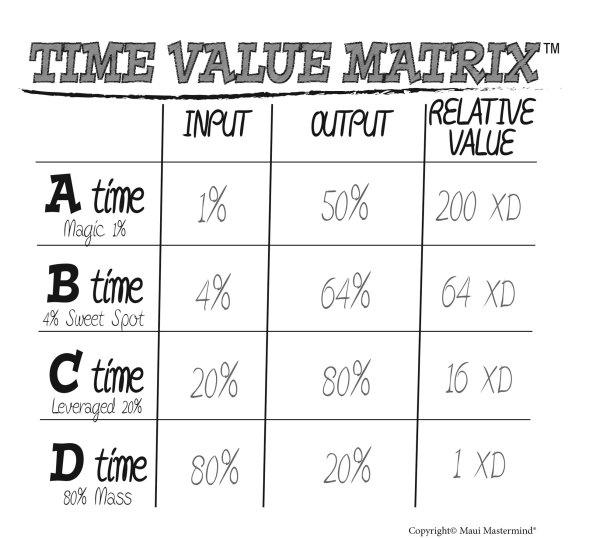 A-time is that magic 1% that generates 50% of your results–for a relative value of 200 times that of D-time. No, this is not an exact science, nor do most people’s activities break down this way automatically. But it does offer a valuable guide to aim for, and it’s a more concrete reminder of the idea that the Pareto principle suggests more generally: All time is not equally valuable. Three hours of your best time on Tuesday may produce a far greater return than 30 hours spent on the low-value tasks you polished off on Monday, Wednesday, and Thursday. While C-time (the 20 in the 80/20 rule) can provide you with a great income, you’ll still always have to work exceptionally hard to earn it. And this is the trap that lots of professionals fall into. They try to increase their earnings by cranking out more high-value hours, which usually just leads to more hours overall, even if it also means to more total value. But more hours will only take you so far! The answer lies in A- and B-time. For me personally, coaching clients–something I do two half-days a week–is C-time. Sure, these eight hours may generate hundreds of thousands of dollars in annual revenue, but I create many times that economic value with my A- and B-time. And I’ve found that my B-time includes giving industry keynotes to large audiences filled with prospective clients, writing books, or developing company systems and staff. These activities take up much less space in an average workweek but produce proportionately much more value. And my A-time activities include making high-level strategic decisions, cultivating key relationships, and developing my leadership team. I could look back at an ordinary workweek and find that I spent only 30 or so minutes doing one of those things and still know that that’s enough. Generally, your C activities are the things that help you produce, while your A and B activities are usually often things that bring new, profitable business through the door. They’re the strategic decisions that impact where the company (and you!) invests its limited energies and spend time developing the capabilities that keep it competitive. Lumping all of these activities together into an undifferentiated 20% segment won’t help you manage the time you actually spend on them. But a little back-of-the-envelope math just might. David Finkel is coauthor of the best-selling Scale: 7 Proven Principles to Grow Your Business and Get Your Life Back.